Despite the love I once had for my front walkway, as time passed and my hydrangeas (across the yard) grew, I was starting to feel a bit imbalanced. So, after much pleading with my TH to help me tear out the majority of the old flowers, he finally gave in to my desires. 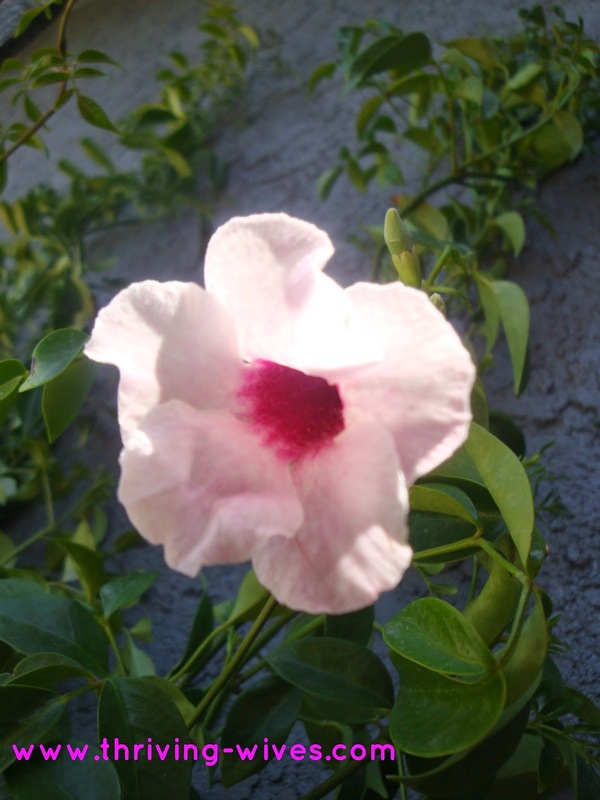 I wanted to go BIG with non rat attracting vines and pretty pops of flower color. 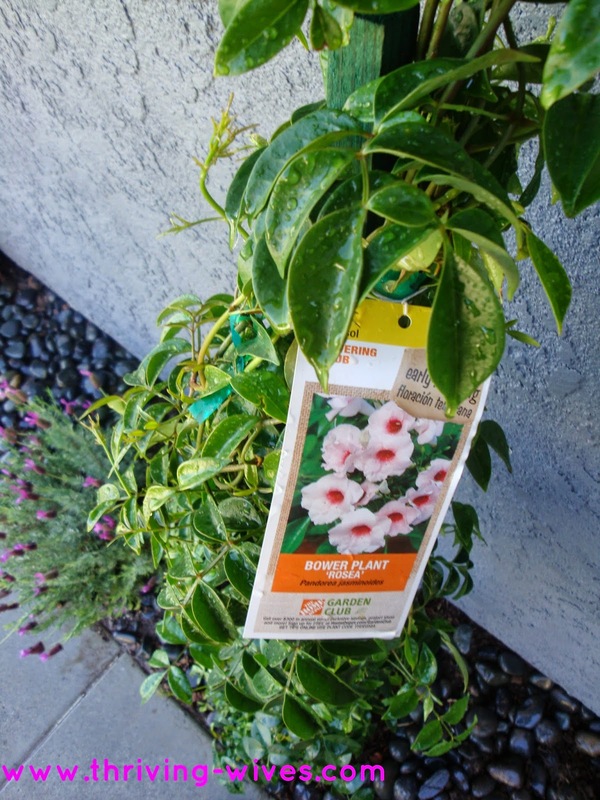 After a few visits to my buddy Vince in the garden department at Home Depot, I finally decided on the Bower Vine. 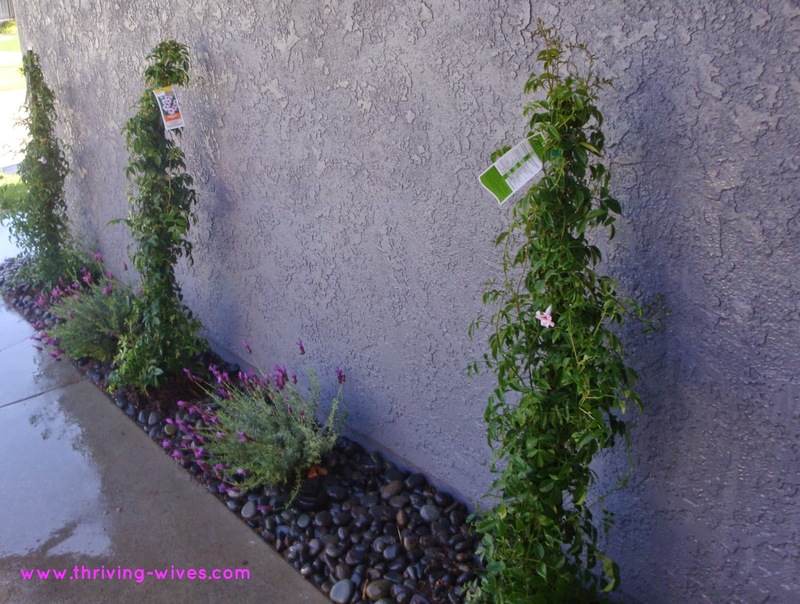 Since we were taking out five of the seven existing plants that didn't seem to be doing so hot, we decided to downsize and get only three vines, knowing that they would grow and fast. 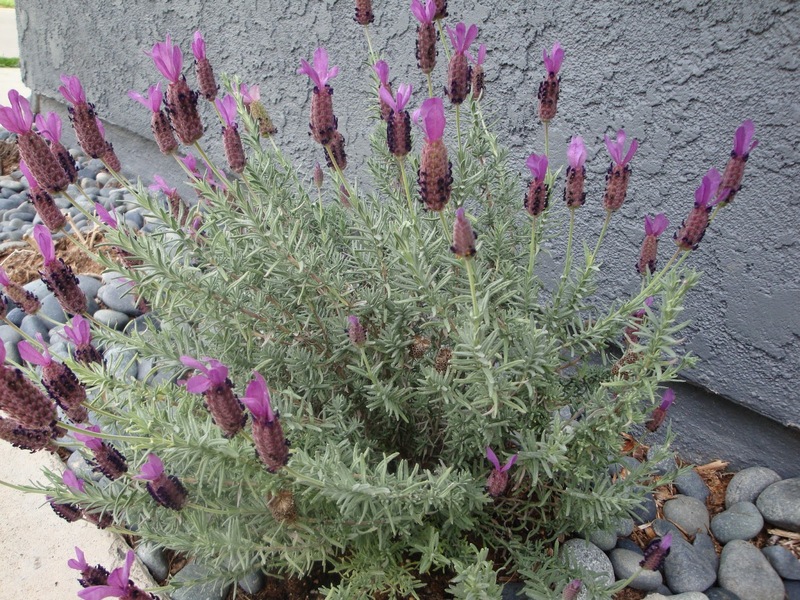 That left us with two low lying lavender to add not only a different color to the mix but also a refreshing scent. 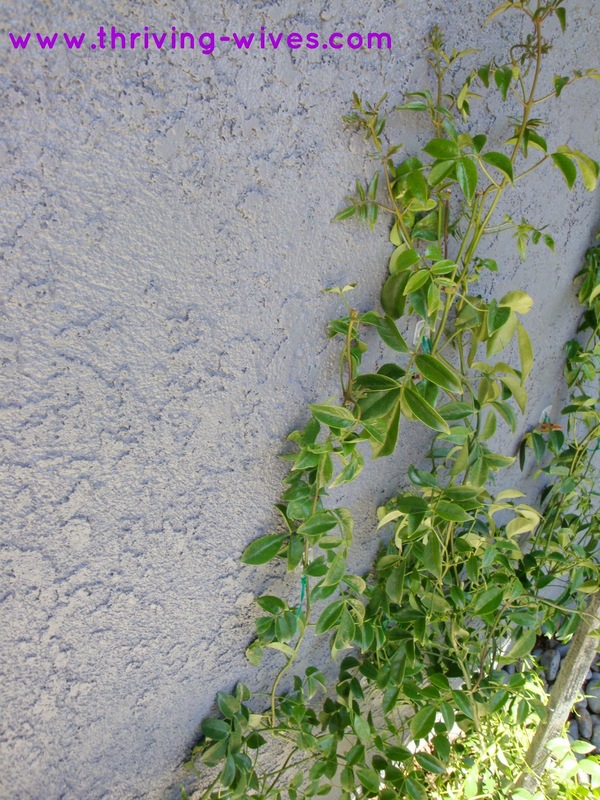 We made our list (mulch, 3 large Bower Vines and plastic tabs that glued onto the stucco to help "shape" the vines. 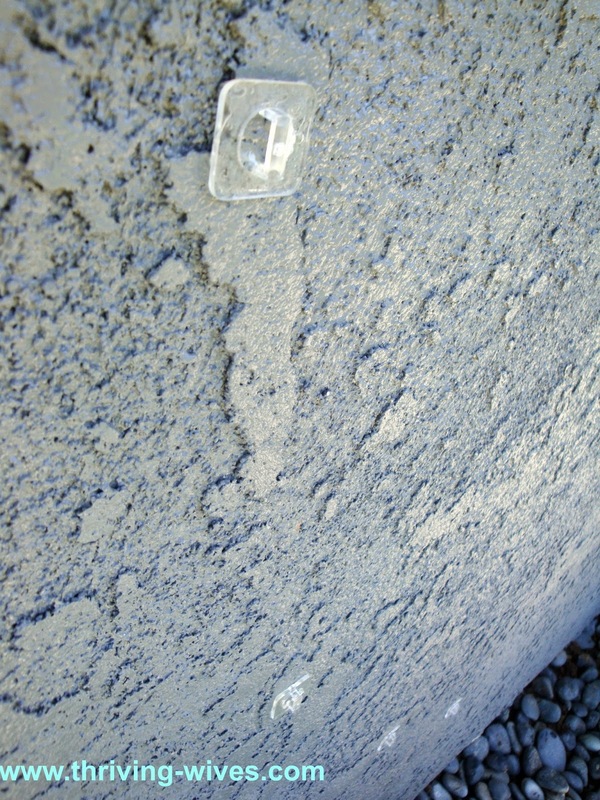 First, we had to remove the existing river rocks in order to take out the old and bring in the new. 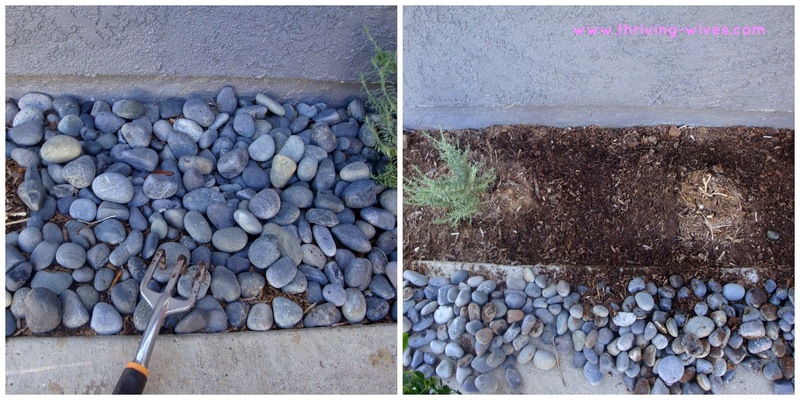 I sat my pregnant self on the ground, grabbed my gardening tool and started to get those rocks off the dirt. 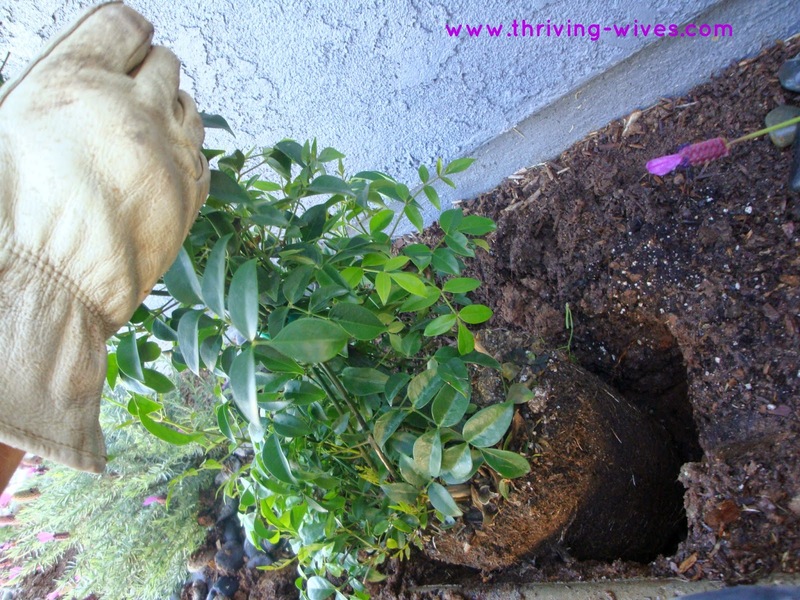 With the rocks moved, my TH started to dig out the plants we were removing, mix the dirt a little and dug out holes for our new plants to live. Once the holes were deep enough, my TH gently removed the plants from their plastic shell and set them deep into their holes. 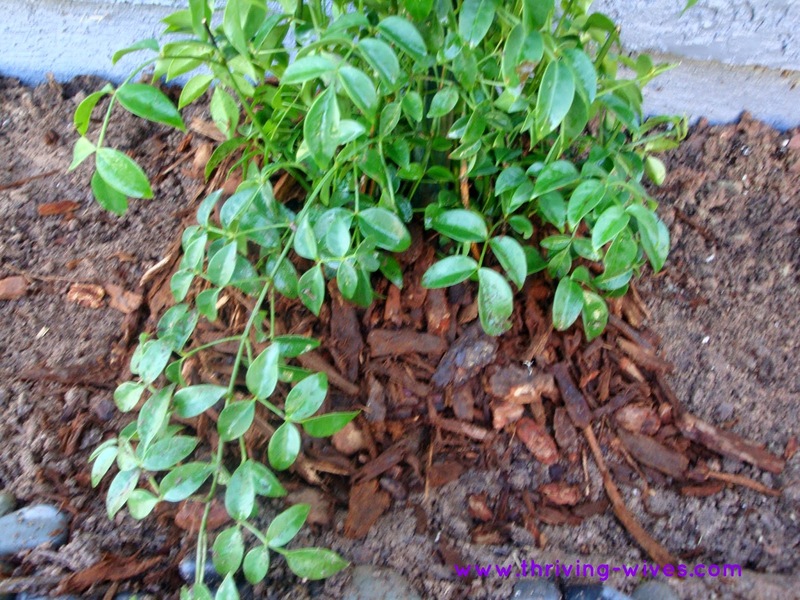 I took to adding in the surrounding dirt and making a nice little mulch bed for each plant. 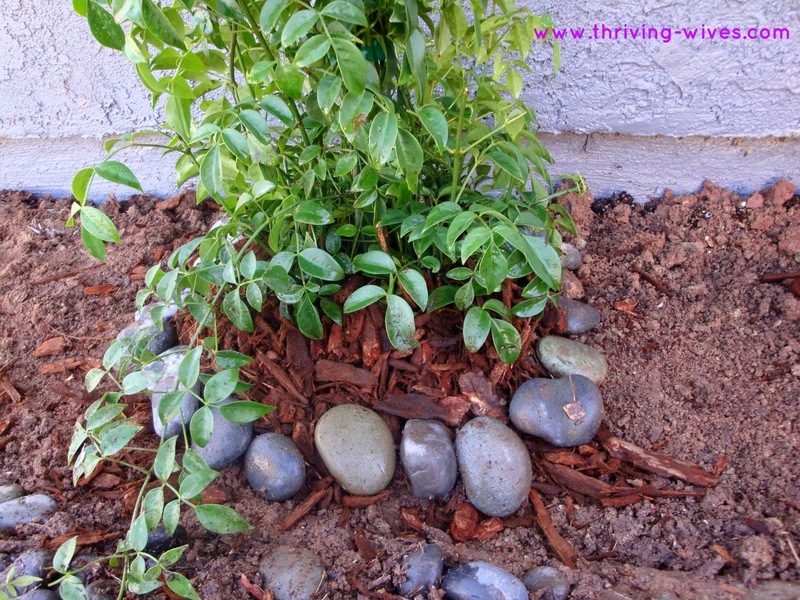 With the mulch laid, it was time for me to create my rock "landing pad" which basically is a circle around the base of the plant (and mulch) made out of rocks. 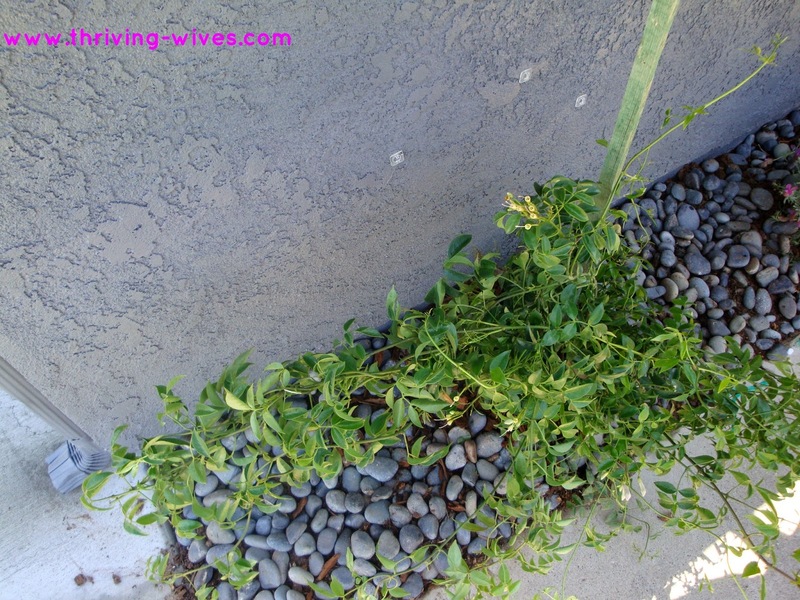 Once the landing pad was laid, I took to slowly adding in the existing rocks around each plant. 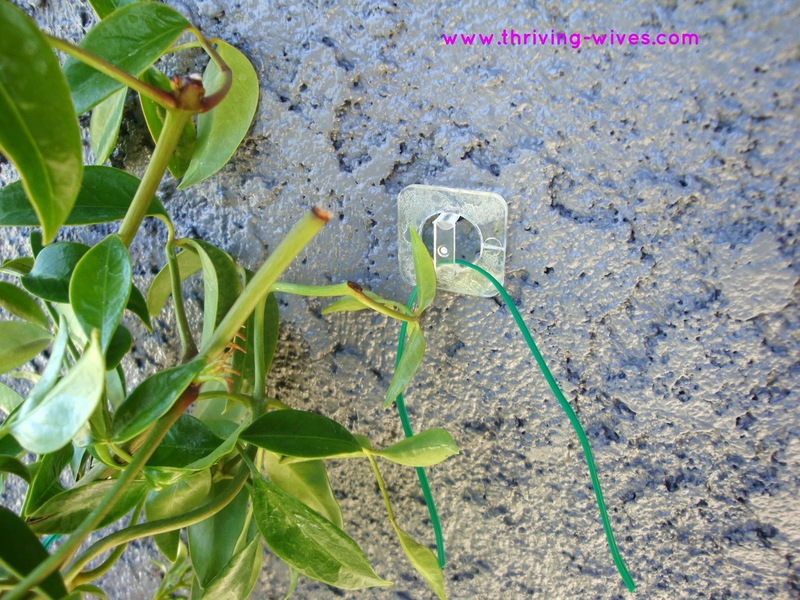 As I worked on the rocks from my seated position, my TH took to gluing the tabs to the wall to help our vines grow. While he meticulously patterned out the tabs, I kept working on those rocks. Once he was done, he assisted me to get things moving (I tend to be rather slow these days). 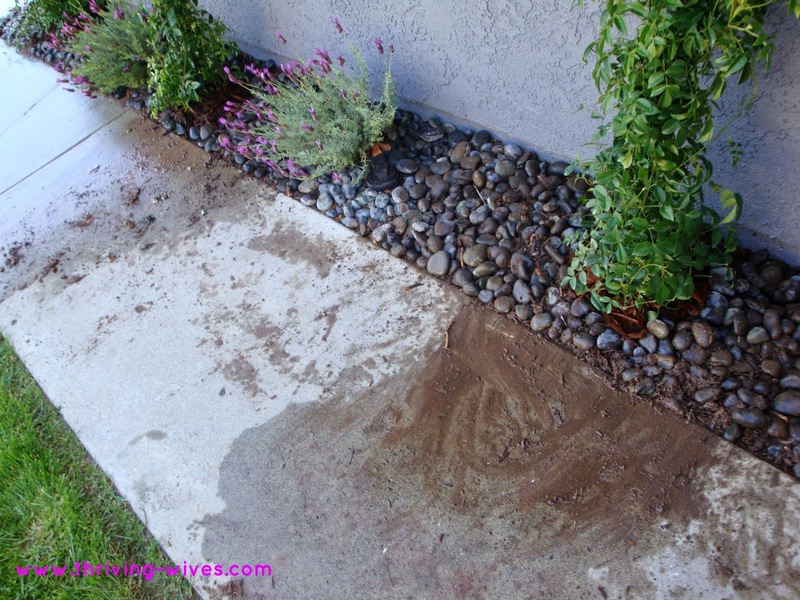 With the rocks in place, the tabs drying, it was time to clean up the dirt mess that was all over the walkway. But, I must say, so far it was looking VERY good! With the large work out of the way, all we had to do now was let these vines free and see what we were workin' with. With the vines excited to finally stretch, we took the ties, looped them in the plastic tab and prepared to help these "arms" stay growing up. Then, my TH took his fancy new saw thing and chopped down the piece of wood holding it up. 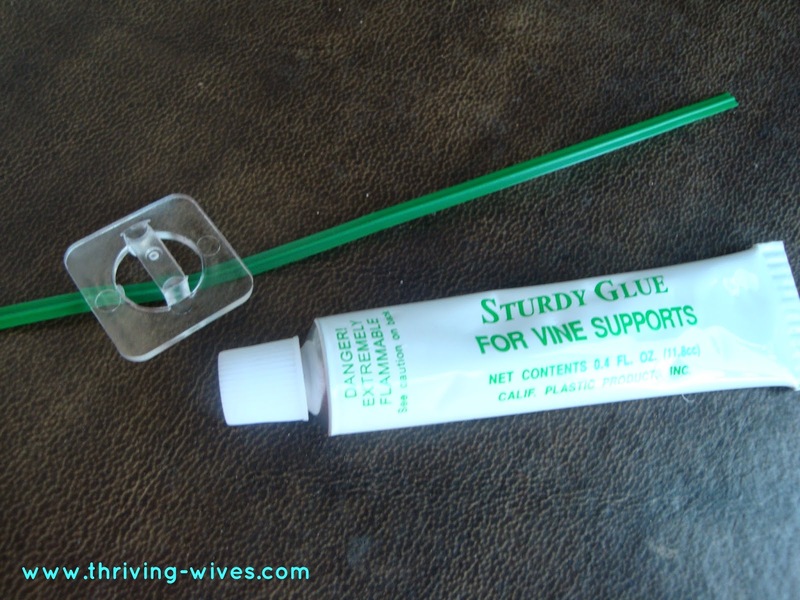 We delicately placed each part of the vine near the plastic tabs and made sure to tie them loosely so they wouldn't feel squished. We moved through each of the three plants and before we knew it we were done! 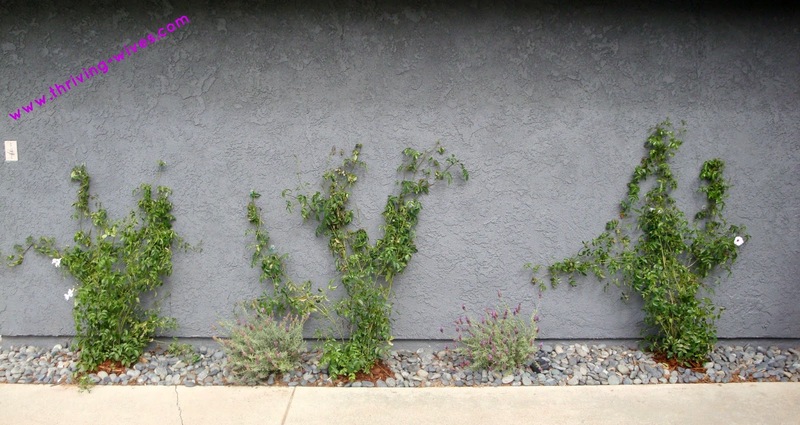 I was SO happy to finally see some balance between each side of my front yard and even more thankful that my TH helped add some curb appeal to our home. Thank you TH! Do you have any garden projects you want to get done this Spring?